It’s berry season here in the Northeast and the first local strawberries have arrived. Smaller and juicier than the California variety that are available year round, these berries are delicious on their own but even tastier in the all-American classic, Strawberry Shortcake. Until now, my limited experience with strawberry shortcake consisted of pound cake (also excellent) and not the traditional shortcake, a sweetened biscuit that acts as the vehicle for the berries and cream. It’s clear that the density and texture of real shortcake changes this dessert entirely, creating a rich and substantial end to any meal. This is another “friends of Paula Peck” recipe. It is adapted from a Blueberry Shortcake recipe in “John Clancy’s Favorite Recipes,” by John Clancy as well as “The James Beard Cookbook,” by James Beard. As mentioned in other posts, John Clancy was a friend and colleague of my grandmother and also a restaurant owner and chef instructor. James beard was of course…James Beard, amazing chef and mentor to my grandmother (amongst other famous chef such as Julia Child). 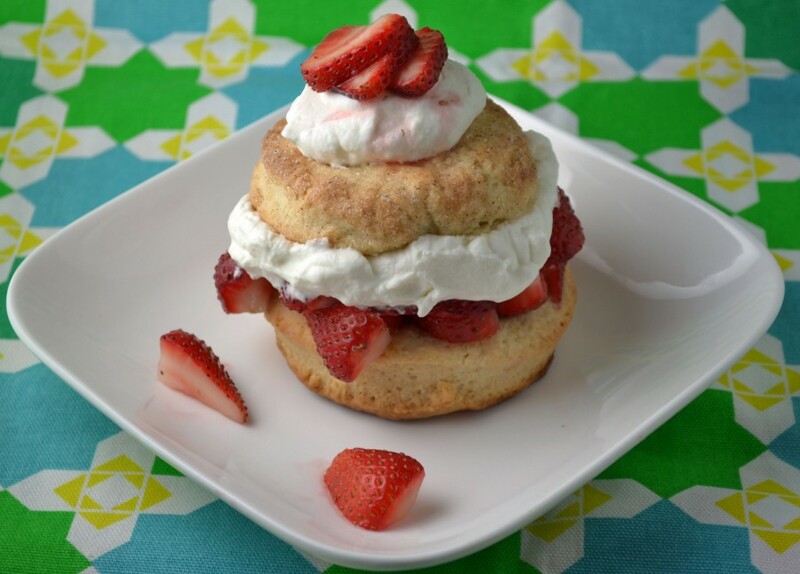 The main difference between the two shortcake recipes is the use of vegetable shortening in the James Beard recipe. Though it provides a flakier pastry, I don’t usually keep shortening around and prefer to use butter. Both recipes contain instructions for one large shortcake to be eaten in slices like regular cake. I prefer individual shortcakes – making more of a personalized presentation and allowing you to put together just a few cakes at a time and save some for the next day. The last adaptation I made is the addition of vanilla extract to the macerated strawberries. While adding sugar to the strawberries, a touch of vanilla goes a long way and makes them even more fragrant and sweet. How can you go wrong with strawberries, cake, and cream? Slice strawberries and mix with both sugar and vanilla extract. Refrigerate for 15-30 minutes. Preheat oven to 400 degrees. Grease or cover a large baking sheet with parchment paper. Sift the flour, baking powder, salt, and sugar into a large bowl. Add the butter and with your fingers rub the ingredients together until they turn into coarse, separate pieces. Stir in the heavy cream with a wooden spoon and mix until a soft dough is formed. Turn dough out onto a lightly floured board and knead it just 1 minute. Divide the dough, making 4 portions. Divide the 4 portions, making one of each of the portions a little larger than the other. Roll the larger portions into rounds 1/2 inch thick and place them on a cookie sheet. Spread the 1 tablespoon of softened butter on top. Roll the second piece of dough into rounds a little less than 1/2 inch thick and roll sides and top in cinnamon sugar (if using). Place them on top of the larger pieces. Bake on the middle shelf of the preheated oven for 20 minutes or until firm. Remove the top layers of the cakes and spread strawberries on the bottom layer. Dollop whip cream on top and replace top layer. Add more whipped cream and strawberries on top layer.